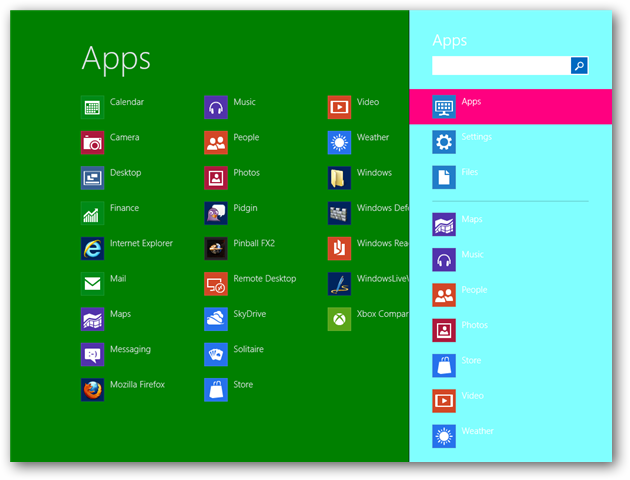 The Metro Start screen is a big part of what makes Windows 8 so cool. The Metro Start Menu will be used quite a bit by most people. That being said, people like to customize their screens and the Metro Start Menu screen is no different. 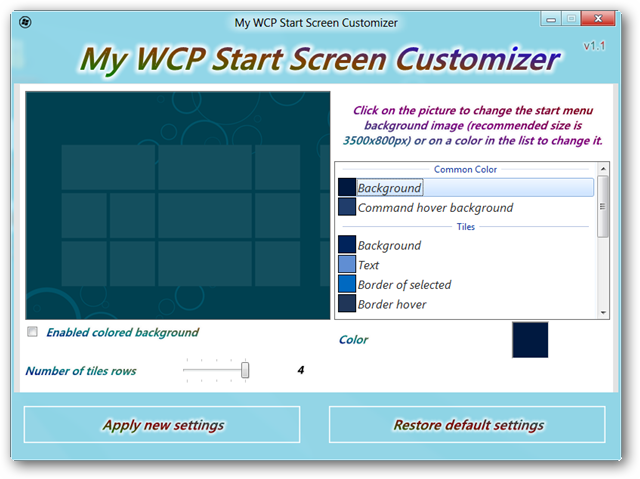 This handy tool will let you make your Menu screen look the way you want it to. 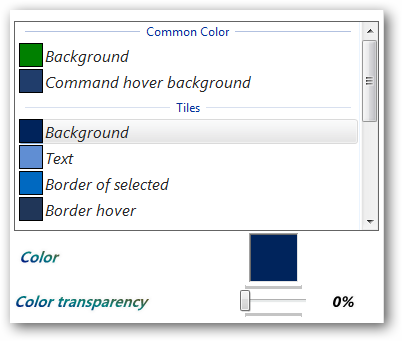 We wrote about how to customize your Charms Bar in Windows 8. If you tried that application out, this one is pretty similar to use. When changing the Metro Start screen, are given the chance to change the background the number of tiles in a row, border colors along with many other tweaks. Read on for more features. The interface is laid out pretty simply. Click on what you’d like to change, then change the color by clicking on the color box near the bottom of the window. Changing the background will be the largest difference to your Start page. Ideally, you will want to resize the picture you’d like to use to be 3500px X 800px. If you have a smaller picture, you can still use it. It is in your best interest not to upsize a picture or it will likely look grainy. The picture I used for this example is 852 X 479 and it worked well. 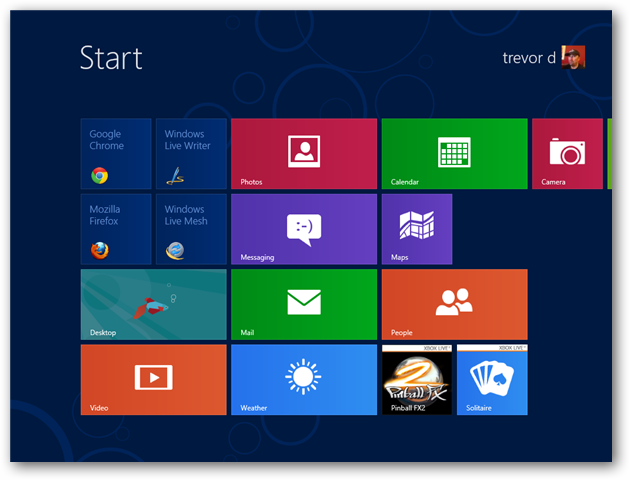 Here is what the Start Menu looks like now. All of these adjustments are similar to do. To make changes, select what you’d like changed in the scrolling list to the right. Then select the color by clicking on the color block at the bottom of the window. You can choose to adjust the transparency of the colors you select. 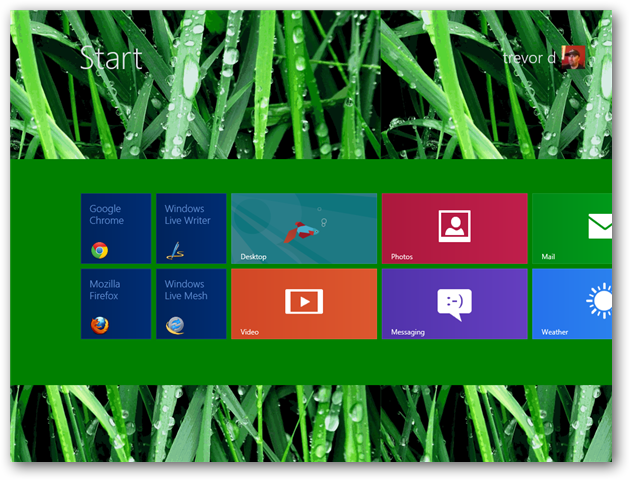 There are other settings you can make to your Windows 8 Menu screen. There are options to change the color of your Start Screen username and group text. The command bar, search and other panes can have colors modded too. The colors are changed just like changing the colors for the tiles. Here is an over the top example of changes you can make. When you can personalize anything, you will use it more. Cosmetic changes are important for programs you use a lot. If they are more appealing to the eye, you will enjoy using them more.